After Alpine, I hitchhiked for the next couple of weeks throughout much of Arizona and deep into the heart of the stakes of Utah. I decided to get back on the bus with my AmeriPass about to expire in Provo and, after a stop in a frat house at the university in Ames, Iowa, and then to Fort Lauderdale for a rendezvous with my friend, Neil, from the Bronx who was beginning a cross-country trip of his own. There, with my bus ticket worth only the paper it was printed on or as a keepsake--which was forsaken decades ago--I then hitched up the east coast to relatives in North Carolina and then back home. And as much as it will always be my home at heart, with conflicted emotions, I would never look at New York City the same, again. Many more hitchhikes of various lengths were to come over the next decade. Unbeknownst to me at the time, according to Roget’s Thesaurus of Synonyms and Antonyms (1911, 1972), under traveler, in addition to such synonyms as wayfarer, itinerant, voyager, vagabond, and adventurer–all terms associated with hitchhiking, there is also Alpine Club! My guess is that this term ambled into the lexicon because members of such association--the first of which formed in England in the mid 1800s--traveled the world to hike and to climb; and is now something of an archaic expression and is traveling on its way out of common usage. However, at the conclusion of my first ride, I too became, possibly a charter member of a new kind of “Alpine” club; this chapter formed in Arizona's White Mountains. The thing is that Roget lists Wandering Jew as a traveling type, too. Curiously, however, Roget give a thumbs' down to the word hitchhiker as a traveler. After hitchhiking from Seattle to Ellensburg, Washington, ca. 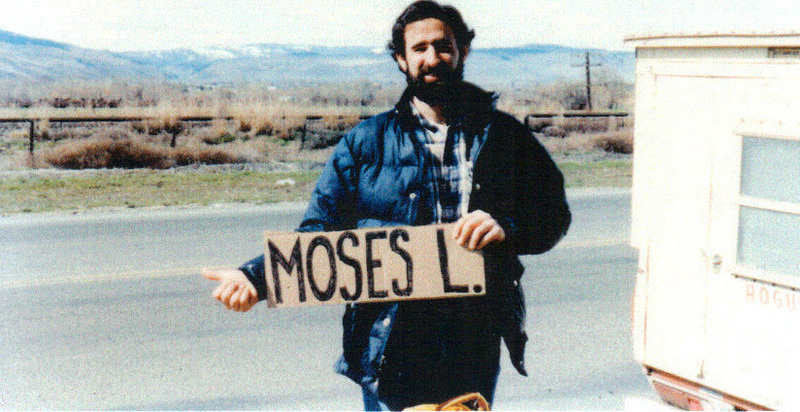 1982, to visit friends Gene and Vicki, I'm photographed here by them at the on-ramp of I-90 thumbing east into the cold desert of central Washington to Ephrata via Moses Lake, to visit friends Cline and Kirsten. It would be 30 years before I would see Gene and Vicki again--this time at my home in Las Vegas, Nevada; after which they sent me this photo. To paraphrase the sentiment credited to a Chinese proverb, every journey begins with a first step–or first stride, if you are particularly anxious to get going. The 1stride on my journey may have been taken when I stepped off the Greyhound bus in Sanders or stretched up into the pickup truck later that day, or maybe at some instant prior or subsequent to either of these chronologically compressed benchmarks in my life. Just exactly what these messages mean and who wrote them, and if they were both left by the same individual, I can only speculate. And exactly what these graffiti have to do with my own journey and my first ride, I cannot yet say. What I can be sure of, however, is that to my story, somehow they are most certainly hitched.